Exciting news just out of Angry Robot: Exhibit A HQ tells me that Relatively Media have acquired the film rights to Richard Parker’s psychological thriller Scare Me and have asked Prison Break actor Wentworth Miller to adapt the novel for the big screen. 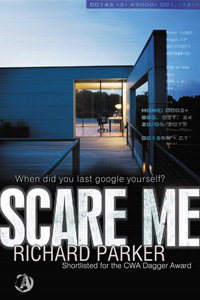 Scare Me tells the story of a wealthy businessman who receives a phone call in the middle of the night asking him, ‘When did you last google yourself?’ He does just that, and discovers a website with photos of his own home, along with six other houses he’s never seen before. One photo shows a gruesome murder. Sounds like it’s going to be a must-watch film. You’ve obviously got great instincts. I really love books that are cinematic.